This smart air quality monitor displays immediate, accurate air quality data both indoors and out, helping you create a healthier, more productive environment. It displays real-time PM2.5 and CO2 levels and packs all the essentials you need to breathe clean, healthy air. AirVisual Node is designed to medical-grade standards to be of special benefit to those who suffer from asthma, COPD, lung cancer and high blood pressure. AirVisual Node instantly shows invisible threats in your air and understands where they come from. Take control to ensure you and your loved ones are breathing healthy air wherever you go. 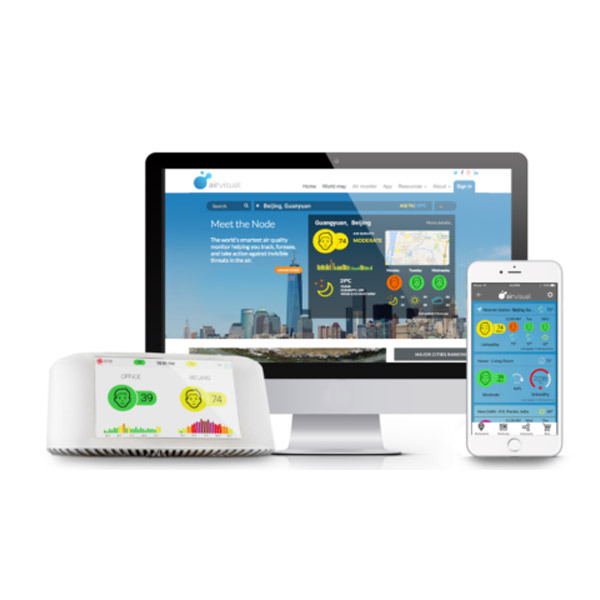 The device also connects to a larger network of monitors, numbering over 10,000 at the moment, which contribute data to AirVisual’s global air quality map. AirVisual Node is a smart air quality monitor that displays immediate, accurate air quality data both indoors and out, to help you create healthy homes and healthy buildings. 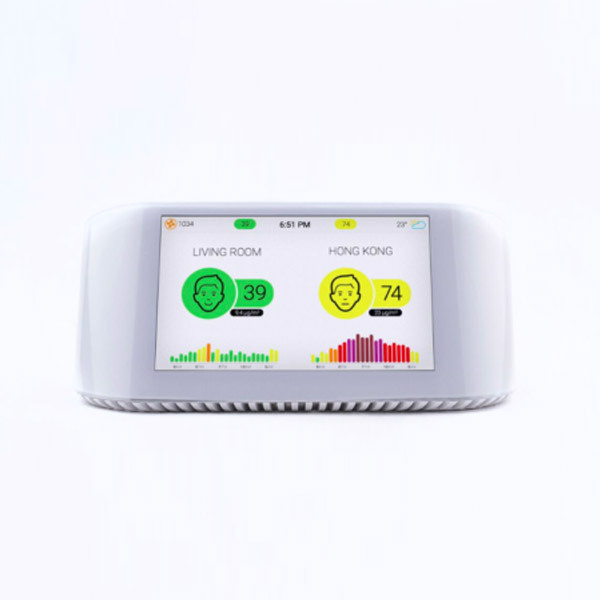 As the most precise consumer air quality monitor on the market, the Node displays real-time PM2.5 and CO2 levels by combining laser technology and artificial intelligence. We made the device to pack all the essentials you need to breathe clean, healthy air. The AirVisual Node was designed to medical-grade standards in order to be of special benefit to those who suffer from asthma, COPD, lung cancer and high blood pressure. Use the AirVisual Node to instantly see invisible threats in your air and understand where they come from. Take control to ensure you and your loved ones are breathing healthy air wherever you go. 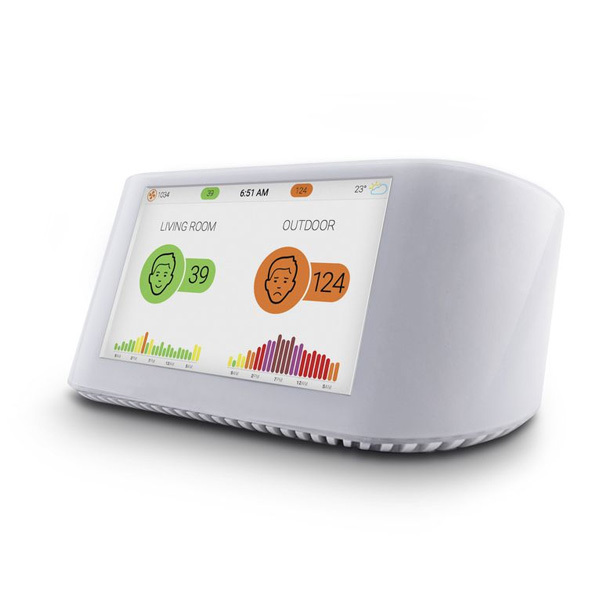 The AirVisual Node, integrates real-time particulate matter (PM) and CO2 readings, along with temperature and humidity, and displays those readings on a 5″ LED screen, along with outdoor air quality data from local official sensors. The Node also displays a three day air quality forecast, allowing users to consider that information when planning their upcoming activities. The device also connects to a larger network of monitors, numbering over 10,000 at the moment, which contribute data to AirVisual’s global air quality map, as well as enabling the company’s “deep machine learning technology” to analyze the data in order to both track the sources of pollution as well as to see trends and improve the forecasting of air quality.